There’s a lot of heavy sighing in my drawing class when it’s time to face the hand. Everyone agrees that drawing the hand is hard. I don’t think it’s hard, so much as complex. But so wonderful! I once spent a week drawing nothing but my left hand, six hours a day. Now I love drawing hands. And I love teaching it. This can be done, boys and girls. Stick with it. For starters, the hand has three parts, the palm, the block of fingers, and the thumb. Just THREE parts! The palm is fairly rigid. 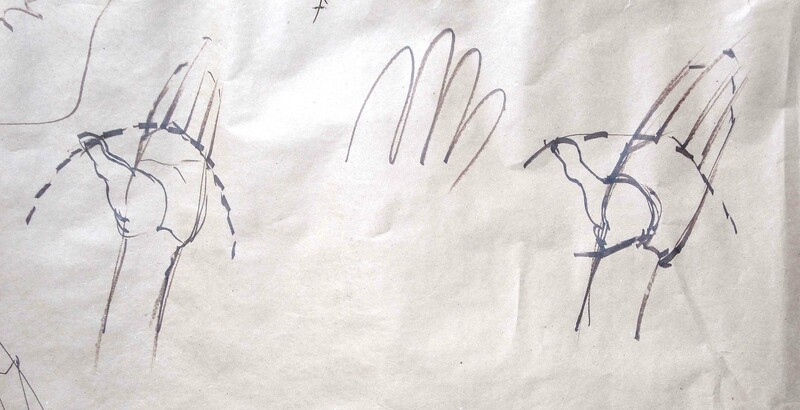 The fingers—unless you’re drawing a Balinese dancer—function pretty much in unison. The thumb is limited in its movement. Well, ok, it’s still hard to draw. But you can organize your seeing of this beast. Here’s how my class room demo looks. Notice hat the length of the fingers is approximately the same as the length of the palm. The thumb’s movement defines an arc. The fingers come out of the palm in a one sided V-form, with the knuckle of the middle finger at the peak of the V.
Unless you’re doing an anatomical study (which I would recommend once in a while, especially at the beginning), try not to overdraw the hand. 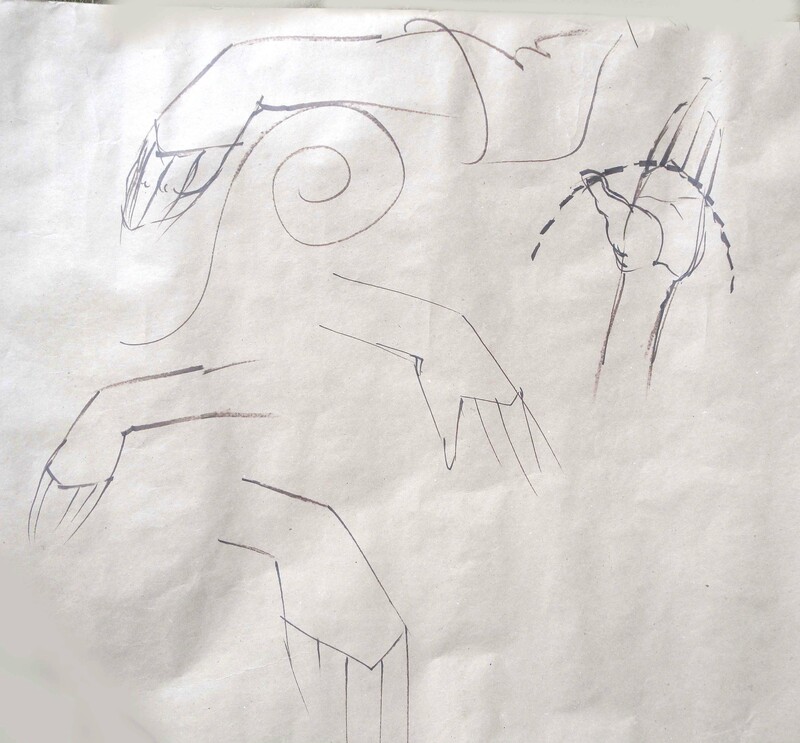 Keep your lines graceful and focus on the general structure, thinking of the hand as a “mitten” form where the fingers are not individually articulated. And allow for some ambiguity. 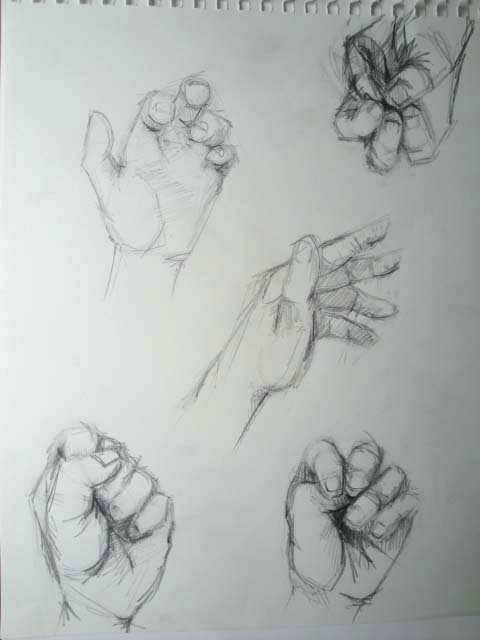 A page of studies of the hand is worthy of being framed. In a future post I want to talk about why that might be, about the emotional significance of the hand to us. Here’s a student drawing by Cheryl B. While my paintings are abstract, I feel the need to draw representationally all the time. I work in series both in painting and in drawing. One of my drawing series has to do with 17th century Dutch art. 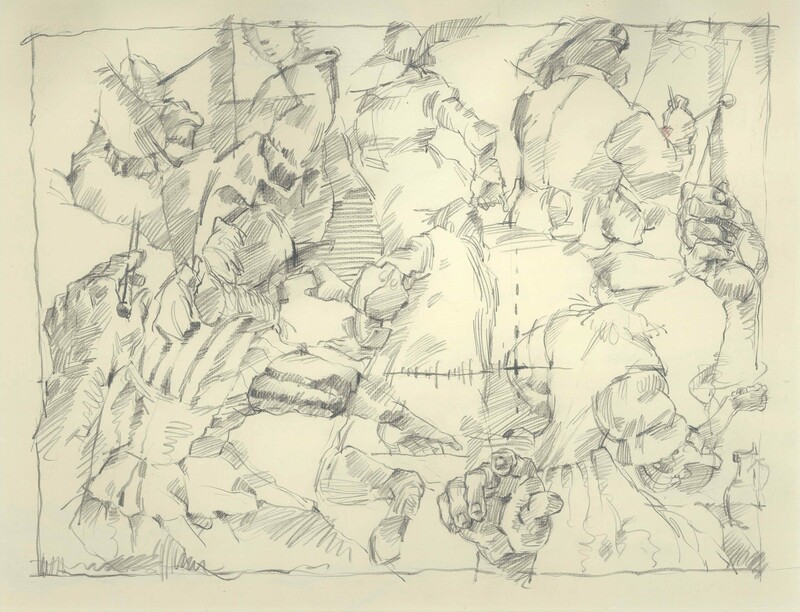 Here is a page of pencil studies derived from figures found in the paintings of Christian van Couwenbergh, Cornelis de Man, Joos van Craesbeck, Johannes Verkolje and Johannes Vermeer. In doing these pages I almost inevitably also draw my own left hand. On this page it appears three times. I tell you, there’s something about the human hand…irresistible.